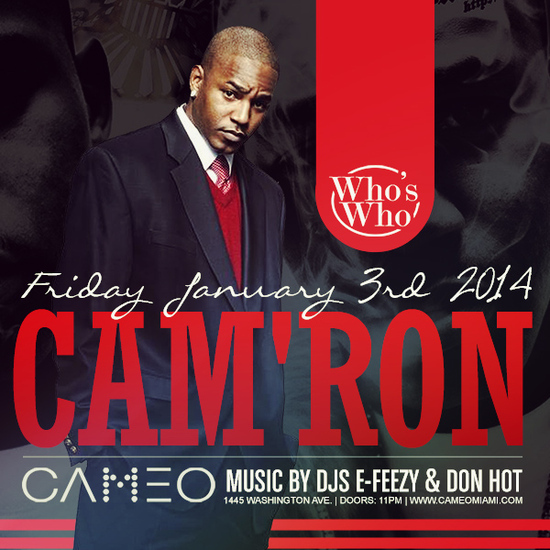 Attend The Crowd Party w/ Cameron @ Cameo , 10:00 PM - 05:00 AM on Fri, Jan 03 2014 @ Irish Playwright Pub , Miami Beach, FL, USA 1 TICKET. 3 PARTIES. ONE AMAZING NIGHT ON SOUTH BEACH! This event... Pre-Party @ Irish Playwright Pub Dance Party @ Club Cameo After-Party @ Kill Your Idol JOIN THE CROWD. PARTY LIKE A ROCKSTAR! Here is the lineup... The Pre-Party, from 10 PM - 12 AM. Meet, mix and mingle with the Crowd. FREE, all you can drinks are on the house! WE BREAK THE ICE with a mix of innovative social games, personal one-on-one introductions, amazing hosts and hostesses, you will never have more fun meeting and making new friends. Plug into the Crowd, and get REALLY ready to party like a ROCKSTAR! The Dance Party, from 12 AM - 3 AM. THE MAIN EVENT. The Crowd heads to one of the Beach's premier dance nightclubs for the time of your life. Huge sounds, huge dance floors, huge crowd. NO mood-killing waiting lines, we deliver VIP entry to the hottest dance clubs on the Beach. Within the Crowd, you are a celebrity, and will party HARD with YOUR CROWD! The After-Party, from 3 AM - 5 AM. The perfect ending to your night out on the Beach. Hosted in a cozy, intimate lounge, you can sit down, catch your breath and cement new friendships made in the Crowd. With FREE drinks on us, it's a quiet place to share a night cap, exchange digits, and of course, create your happy ending.... PRE-PARTY @ DANCE PARTY @ AFTER PARTY @ GET YOUR PARTY PASS NOW! 1 TICKET. 3 PARTIES. ONE AMAZING NIGHT ON SOUTH BEACH! JOIN THE CROWD. PARTY LIKE A ROCKSTAR! The Pre-Party, from 10 PM - 12 AM. Meet, mix and mingle with the Crowd. FREE, all you can drinks are on the house! WE BREAK THE ICE with a mix of innovative social games, personal one-on-one introductions, amazing hosts and hostesses, you will never have more fun meeting and making new friends. Plug into the Crowd, and get REALLY ready to party like a ROCKSTAR! The Dance Party, from 12 AM - 3 AM. THE MAIN EVENT. The Crowd heads to one of the Beach's premier dance nightclubs for the time of your life. Huge sounds, huge dance floors, huge crowd. NO mood-killing waiting lines, we deliver VIP entry to the hottest dance clubs on the Beach. Within the Crowd, you are a celebrity, and will party HARD with YOUR CROWD! A friendly atmosphere with hand painted murals depicting the charm of the old country. Our affluent interior hints of old cultured Dublin, recreated by master Irish craftsmen. Famous Playwrights glance from the walls, content with the excellent food served, from our extensive á la carte, to our tasty and hefty pub food. Come on in and surprise yourself with our serious high standards, moderately priced. Look around and see why our customers come back "again and again!" GET YOUR PARTY PASS NOW!